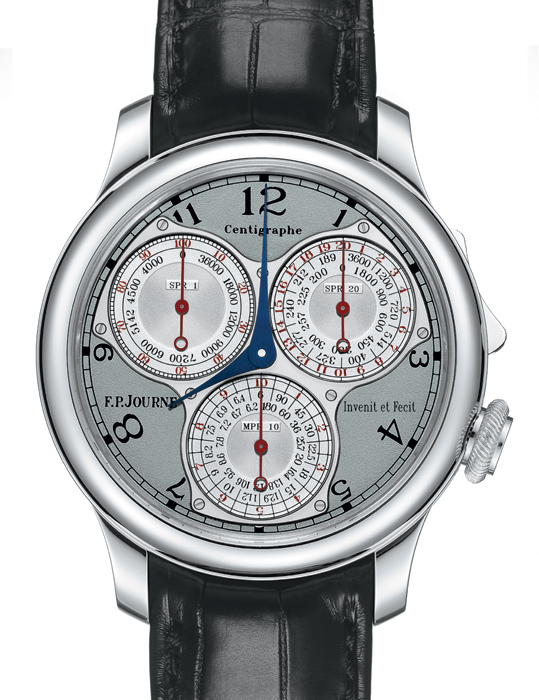 Geneva, April 8, 2009, François-Paul Journe is acclaimed once again for its horological creations of exception. 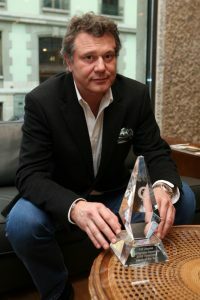 William Rohr, general Manager of Timezone.com, has awarded the timezone.com trophy « Watch of The Year 2008 » to F.P.Journe for the exceptional chronograph the Centigraphe Souverain. The ceremony took place in the exhibition room of the F.P.Journe Manufacture in Geneva. F.P.Journe is delighted to reconfirm the success of this spectacular mechanical chronograph, already awarded a few month ago by the highest horological distinction “Aiguille d’Or” (Golden Hand) at the Grand Prix d’Horlogerie of Geneva on November 13, 2008. The Centigraphe Souverain offers 360’000 km/h. at your fingertips; the art to convert 6 km/h. in 360’000 km/h. centre of Geneva. It vouches an authentic and innovative horology in the whole of its conception and symbolises the fundamental values of haute horlogerie. F.P.Journe is mastering the measurement of time with this new mechanical chronograph unlike any other ever made before. The hand-wound movement of the Centigraphe Souverain measures elapsed times from one hundredth of a second to 10 minutes on three dials, each with a time scale in red and a tachometer scale in black. The tachometer scales convert times into speeds ranging from 6 km/h – the walking pace – to 360,000 km/h, well above the escape velocity of a rocket going into low-level orbit. The Timezone.com Watch of the Year Prize has been created in 2003. It is prepared by 40 Timezone moderators around the world who are selecting 10 watches commercialised within the year, for their complexity, skilful innovation, expertise of realisation and aesthetic. During 3 weeks, each Timezone members can vote for the watch of the year of his –her- choice. The voting is taking place in January and the result is published in March. The Centigraphe contributes to the Medical Research of the ICM – Institute of Brain and Spinal Cord in Paris- to help fight against brain and spinal cord diseases such as Alzheimer, Parkinson, Multiple Sclerosis, … François-Paul Journe has committed next to Professor Gérard Saillant, Luc Besson, Jean Réno, Jean Todt, Michelle Yeoh and Michael Schumacher, amongst others, to donate 30% of the profit of the sale of each Centigraphe to the ICM.